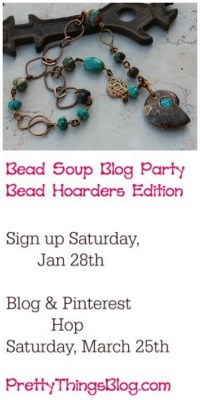 Art Bead Scene had a lovely post today about throwing a Bead Soup Party, and I thought it was a fantastic idea! I decided to take that idea and make it a virtual party -- won't you join the fun? 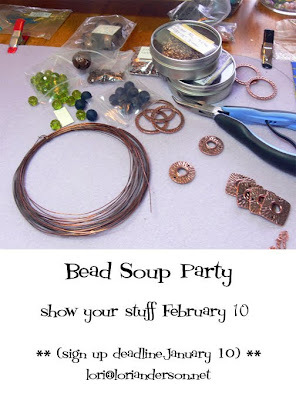 Next, email me by clicking here or using the address in the above photo to let me know you want to go to the Bead Soup Party. When you get your package of beads, you make something with it, take a picture, and post it on your blog on February 10th. 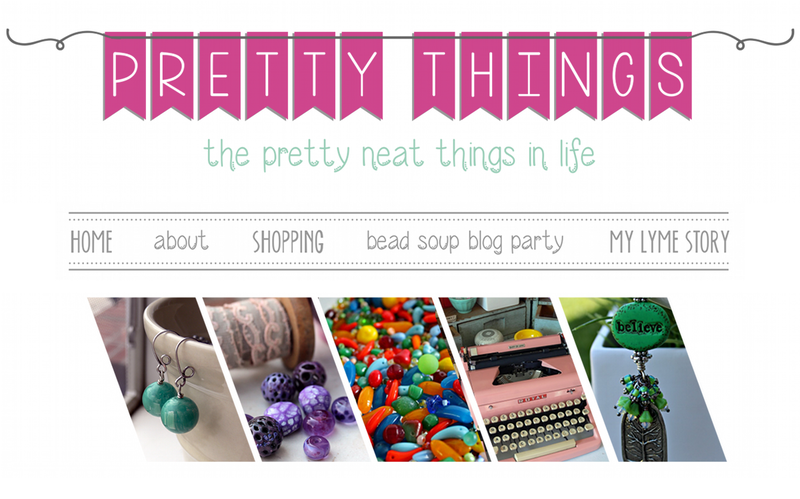 Then everyone hops around to all the Party Blogs to see what you made! So what are you waiting for? Grab your party invitation (the button below), post it on your blog, tell all your friends, and let's have some fun! 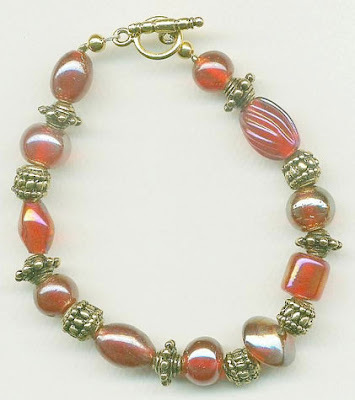 Head on over to Art Bead Scene to see the bracelet I submitted for this month's beading challenge. Each month, a piece of art is chosen for beading inspiration, and you wouldn't believe some of the amazing entries. The Art Bead Scene Flickr pool is here, and you can see what I mean when I say there are some VERY talented artists out there! I loved Jeannette Walls' first book, "The Glass Castle", so I was overjoyed when I heard she had another memoir coming out. I got this book for Christmas, so dug in and finished it last night. This book, about Jeannette's grandmother and peripherally, her mother, filled in some gaps from the first book, which covered Jeannette's life. If you haven't read "The Glass Castle", I'm hear to tell you that her life was interesting, horrifying, daunting -- but ultimately, uplifting. Tonight I'm going to reread "The Glass Castle" to see if I feel any differently about the story and the many hardships Jeannette and her siblings endured having now learned more about the mother's and grandmother's hardscrabble upbringing and background. "Half Broke Horses" is fascinating, to say the least -- Jeannette's grandmother taught school before she graduated high school, flew airplanes, and helped run a horse ranch, among other things. If you haven't read either book, no worries -- you can read either one firstwith no problem. What do you mean Christmas only comes once a year? Oh, but there are presents involved? And family? And lots of good food? Well. That's ok then. 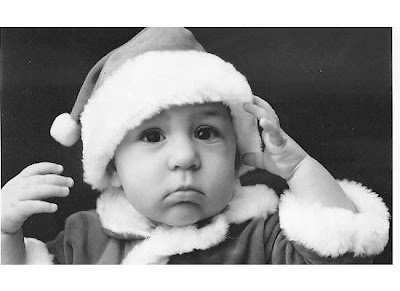 (Zack at eleven months old -- photos by Jen Fariello). I try to be price-conscious when I make my jewelry. 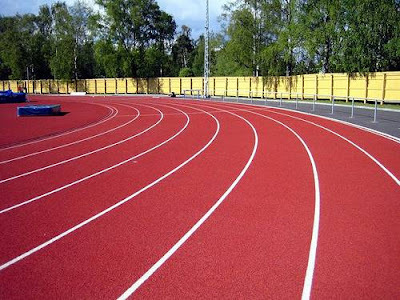 I am well-acquainted with my customer base and know what they like and what they are comfortable spending, and I choose my components accordingly. 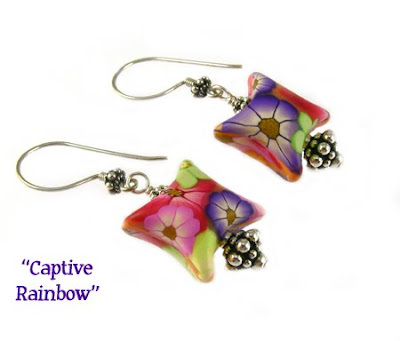 I love handmade lampwork glass, intricate sterling silver, and gemstones, and I've gotten fairly good at creating a body of work that covers a reasonable price range. Sometimes, though, I throw caution to the wind and with wild abandon, go for luxury. I just posted the above piece on my web site last night. It's absolutely amazing if I do say so myself. 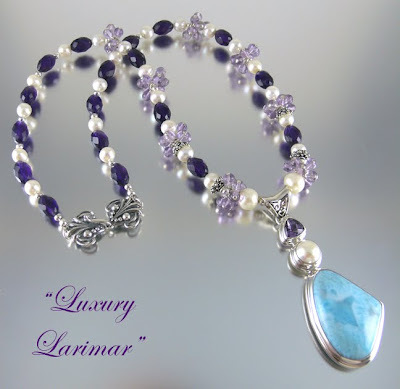 The pendant is a large piece of rare larimar set in sterling silver, accented with a cultured white pearl and a faceted amethyst. I made lots of tiny pale amethyst dangles to cluster around deeper amethyst ovals and more cultured pearls. 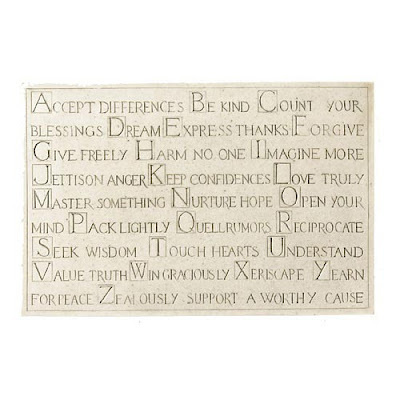 The result is really stunning -- and of course there's a price tag to it. I posted this necklace on my blog some time ago, never planning to put it on my web site because I was afraid the price would scare people off. But one of my customers saw it on the blog, emailed me, and it's now in a new home. The point of this post is to say to fellow designers -- be you painter, sculptor, jewelry designer, any type of artist -- don't be afraid to take a chance. I've made a commitment to myself for the coming year to push my boundaries and try new things, and sometimes, designing without limitations can bring surprises. I'm still cognizant of my target market and I certainly don't want to alienate my loyal customers, but a little exploration is good for the soul. Lori Anderson's work can be seen at www.lorianderson.net. She'll be starting a new blog at www.AnArtistsYearOff.com on January 1st. I want to thank all of you who shared your thoughts in response to my post on what it means to be an artist. I've had a few conversations with friends about it, read your very insightful posts, and come to the conclusion that I need to continue what I'm doing -- making what feels right for me. I also need to give myself the chance to breathe and to grow, and I'm even more convinced that taking time off next year is the right thing to do. 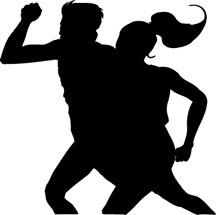 Going from twenty shows to five shows and one fundraiser is a huge change -- and as I write this, I just tore up an application to a show that, while very lucrative for me in the past, would just defeat the entire purpose of what I'm trying to do. It's scary, losing that income, but it's necessary. 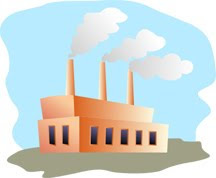 One person asked if I wanted to feel less "like a factory", and I do. I make a lot of jewelry, and I like to do that, and since I have insomnia, I get a lot done while Zack's at school and while he's asleep. But the more time-intensive jewelry I'd like to make requires I not make as many pieces, and that wouldn't be possible with as many shows and the amount of travel I've been maintaining these past four or five years. So I'm just going to go with the flow. I bought a lovely daily planner, and I'm going to keep a loose to-do list. 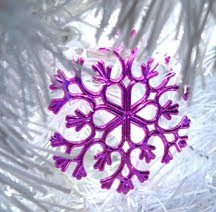 I don't want to get to rigid, but I don't want to find myself in December 2010 with nothing to show for my year. I'm going to write, explore, goof it up, succeed, and breathe. Thanks, blogger friends, for being there for me. 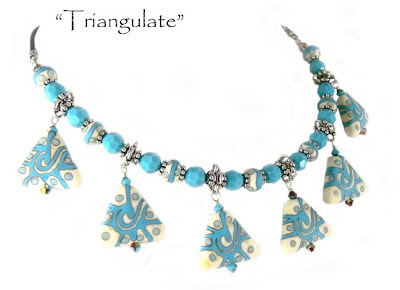 Lori Anderson is a full-time jewelry designer who sells her work at www.lorianderson.net. 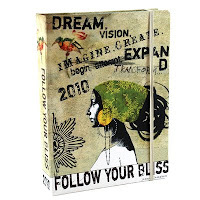 She'll be exploring new avenues in her blog An Artists Year Off beginning January 1st. Winchell Clayworks will be notified directly by ArtBeads.com with the gift certificate code. Congratulations, and thank you to all who entered! I've been thinking about this post for days -- months, actually. It's one of those soul-seeking sorts of blog entries, an introspective "take a good, long look" posts, and I wonder, how many of you have had the same thoughts? I started making jewelry back before Zack was born, when I was on a short period of bed rest. I played at it, but quickly got hooked. A move to a new house and a new town and then a new baby squashed that hobby for a while, and it wasn't until about a year later that I dug in with any real seriousness. Well. Um. Hmm. I guess it's safe to say, I've come quite a long way. But not nearly far enough. Not in my mind. I want to Be Known. Just reading that sounds horribly narcissistic, but let me explain. And maybe, at the end of this post, you'll understand what I mean. Once I figured out how to make decent jewelry, I started the juried craft show circuit with a vengeance. Most years I did 15-20 shows a year, and the shows were mostly 3-day shows. That translates into having to create a LOT of jewelry in a condensed period of time. I wanted to try all these new techniques, but where was the time? 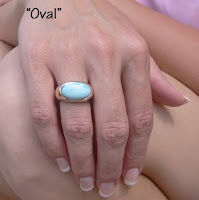 Even though I am a full-time jewelry designer, I'm also a full-time mom and wife. At first, it was all a rush, selling things and making things. 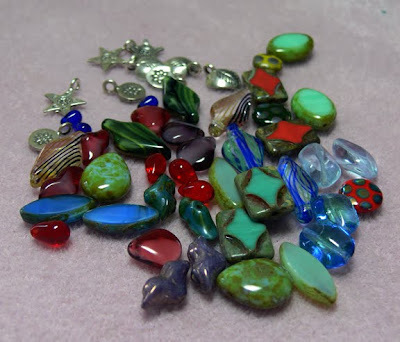 But then this nagging thought kept pecking at my brain - did people buy my jewelry because I knew how to pick out pretty beads (that someone else had made) rather than because of the design? More and more, this has bothered me. I love supporting other artisans by buying their amazing glass beads, but unless I step it up a notch, I'm never going to make a name for myself. Yes, I've been published in magazines, but that's not from their noticing ME -- it's from me sending in a huge number of emails with photos in it, and getting a lot of rejection letters in the process. I have talked about this recently with another designer friend of mine -- that never ending quest to get noticed, to make a name for ourselves, wondering how others do it. I look at artists I admire -- Stephanie Sersich, Deryn Mentock, Kecia Deveney, Vanessa Valencia -- all who have huge followings. They're also giving and gracious, which I strive to be. I know I'm always disappointed and lose my opinion of those I admire who don't take the time to acknowledge those who look up to them. So what do I do? How do I get noticed in a sea of millions? 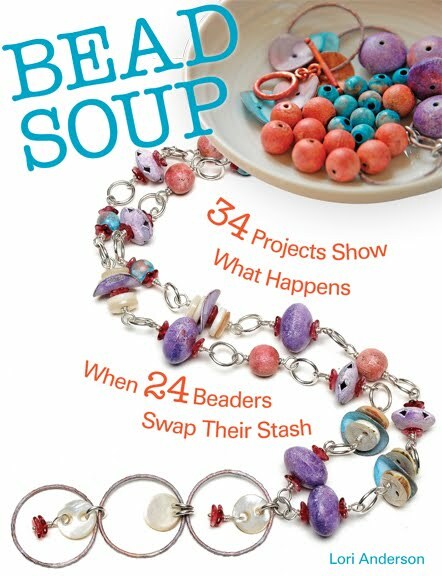 How do I get the authors of the beading books and magazines to seek ME out instead of the other way around? How do I attract people to my blog and how to do I touch anyone's life, inspire someone to creativity, if I doubt my own? That's one of the many reasons why I started my new blog, An Artist's Year Off. 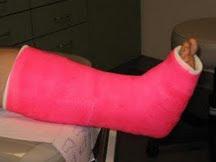 In order to get noticed, I think I need to set myself apart. Make my own beads. 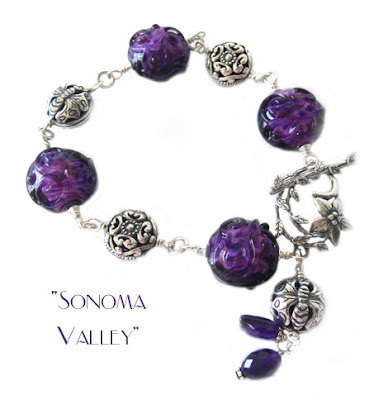 Learn to use the beads I have in innovative ways that don't look the same as everything else. Up the ante with my photography. Something. Wish on a star. I don't know. I'm not going to be like Lana Turner, discovered at a soda fountain. I've gone on quite long enough. I didn't write this to have commenters pat me on the back or anything, so please don't think that. I'm interested in how you hurdled any road blocks, how you found your muse, and how you reconciled yourself to yes, you ARE an artist. On January 1st, I'll start writing An Artist's Year Off, my blog that will be a journey into different art media, a search for who I am in the art world. I hope you'll follow it, and start your own! I have a new post on Watch Me Create. This one is about WHERE we create, and how it influences WHAT we create and how we feel when we do it. In this particular post, you can explore my office, which is where I do all my computer work, PhotoShopping, photography, invoicing, packing, writing, and planning. I don't actually make any jewelry here, but since so much of my business relies on these things, I thought you might like to explore the inner sanctum. 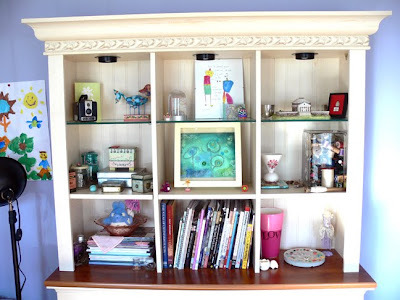 If you'd like to learn more about the particulars of the collection in my bookcase, you can click here and read in more detail about just what each item is. I love the holidays. I love exhibiting at craft shows, because the energy is almost electric -- people buzzing about and buying handmade (yay for artisans!). I love cold weather, and I love decorating the Christmas tree with my son. It's always a fun tree. I mean, what else would you expect from someone who makes jewelry like this? 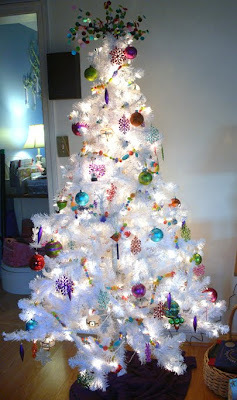 When Zack was three, he decided we had to have a white Christmas tree. I have no idea why, and he never could say why -- he just wanted one. We drove all over several towns looking for one that didn't cost a mint, finally finding one. We then went aisle to aisle picking out colorful ornaments, as my traditional ornaments wouldn't do. I have lots of ornaments I've collected over the years; blown glass, annual White House ornaments, white bisque snowflakes, and a few antiques. None of these would do for Zack. This year I asked Zack which color tree he wanted to put up and he emphatically and rapidly stated, "WHITE." White it is, then. We sorted through ornaments, took a trip to Target, and ended up with this. The garland is made of pop-beads that Zack and I put together. We even used the bracelet and ring blanks and hooked those on the branches. A bunch of sequins exploding out of the top -- this was a point of contention between Zack and I, as he didn't like it and I did. I won. and an ornament that Zack bought me at his school's Little Shoppers event. I was really touched by that, and I'm not going to put it away at the end of Christmas, but find a place for it in my office. This is hung over my computer desk. 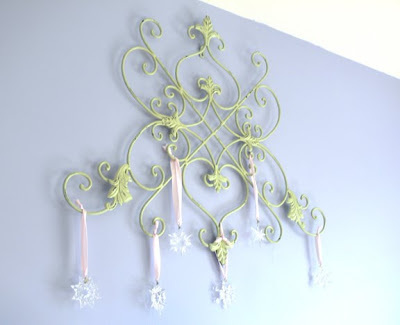 It's a big vintage-inspired iron wall hanging, and hanging from pink satin ribbon is a collection of Swarovski crystal snowflakes, given to me by my husband, one for every year that I've been making jewelry. Each year I get one, and they're just too pretty to relegate to the ornament box at the end of the season. Lastly, I'll leave you with a tradition that I started when I married Rick. Each year, he, his boys, and Zack get to open one present on Christmas Eve, and that present is an ornament for the tree. My thought was that when Zack is ready to start his own home, he'll have a box of ornaments to start his own tree. I got a late start with Rick's sons, but I hope it's a tradition they'll carry on with their own families. If you have a blog with a photo of your tree, or care to share a holiday tradition, please make a comment below! 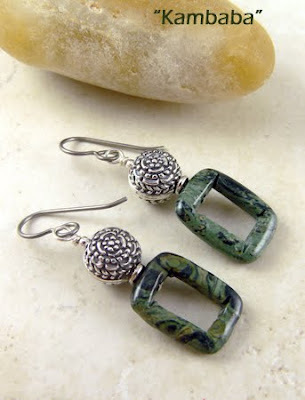 This month, ArtBeads.com asked its blog design partners to review their glass and sterling silver collection. This was exciting for me, because I loooooove the Czech bead selection and I immediately had an idea in mind. One of the things I like to work into my jewelry designs is texture. The other thing I like to do is add color, and as many color combinations as I can get away with. I've made a number of what I call "Bead Soup" bracelets, and with that in mind, I set to work. First, I poured all my beads into a pile. I knew I wanted to make a multi-strand necklace, so I pushed beads around until I got a rough approximation of how many strands I could make and how the beads would look the best. I don't make many multi-strand designs -- in fact, I could probably count how many I've ever made on both hands and have fingers left over. But I wanted to show off all these beads to maximum effect, and cutting three pieces of beading wire, pulled out a hank of tiny black seed beads and strung beads for the next two hours. You may wonder why that smallish pile of beads took me two hours to work with. Well, it's like this -- randomly placed beads are really not so randomly placed! This type of jewelry needs balance, and I found myself stringing along, only to pull beads off to start over with a few more here, a few less there. The asymmetry was a happy accident. I meant for the necklace to lie like a regular necklace, with all three strands hanging from two large rings. However, as often happens, when I dropped the necklace on the table to run and grab the phone, I came back to find that the piece had fallen into a different arrangement. I quite like new look, and if the wearer wants to wear the necklace in a more traditional manner, it can easily be done. 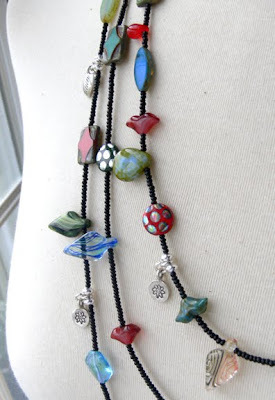 I think of this style of necklace as a "Story Necklace", because each bead can be used to tell a story. I've seen this sort of thing used in nursing necklaces, where mothers tell a story using each bead as part of the tale they make up and tell their child. 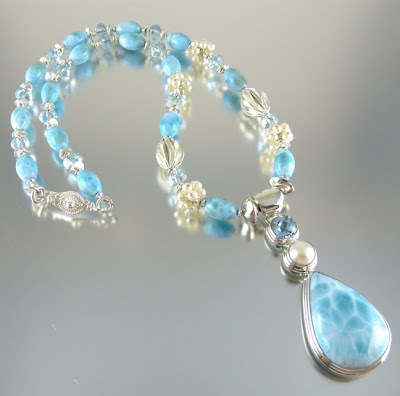 I hope you like the necklace, and I encourage you to visit ArtBeads.com to pick out your own beads and create your own Story Necklace. 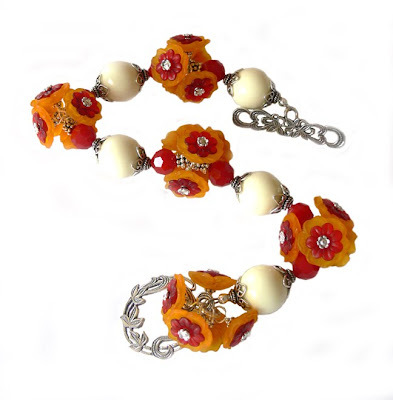 You can buy their Czech beads by the piece, and don't forget to explore their other sections for more design possibilities. And to make it that much easier to bead, ArtBeads and I are giving a lucky winner a $25 gift certificate to their web site! 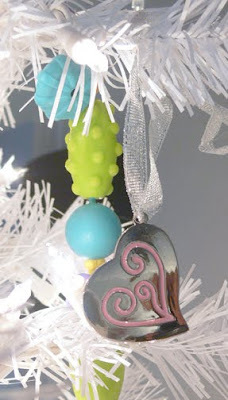 All you have to do is leave a comment below and tell me what your favorite section of ArtBeads.com is. 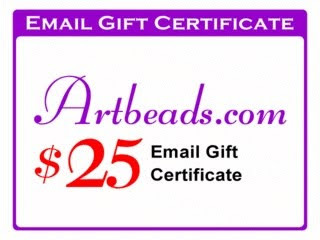 Be sure to leave an email so ArtBeads can email you the gift certificate. I'll announce the winner on December 22nd! 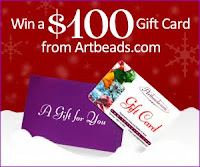 ArtBeads is also running a Holiday Cheer Sweepstakes on their Facebook page. You could win a $100 gift certificate to their fan site! Click here to enter. Cindy of Sweet Bead Studio! I really do like giving things away, so I plan to have more of this type of thing in the future -- so stay tuned. THANK YOU to everyone who commented! Get those comments in to win free beads! Go to This Post to see the details! You have until midnight tonight! I'm excited to unveil my new blog, www.AnArtistsYearOff.com. I hope you'll go over and follow it. It will only last for one year, and I will of course keep this blog, but the new blog will chronicle my explorations into new realms. In the past five years, I've made some (I think) really pretty jewelry -- but it's time to up the bar. I also hope to encourage anyone who feels that they can't create, or are "too old" to create. I can't tell you how many emails I get about that, or how many people come up to me at craft shows and wistfully say they would like to try but feel that ship has sailed. I'm QUITE certain I'm going to make a lot of mistakes as I try new things -- drawing, painting, lampworking, and even writing a book. But I'm challenging myself to get over the fear, and just TRY. And get over even more fear and share the experiences. 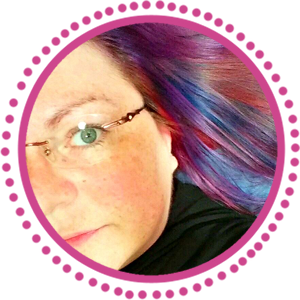 I'd love for you to join me, comment, share your own journey, and even start your own blog, as a sort of New Year's Diary, a way to see what you started with on January 1st, and what you end up with on December 31st, 2010. 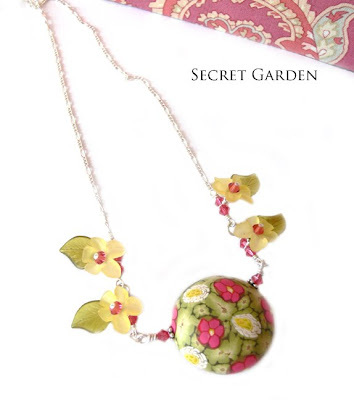 My personal favorite design of all that I've made is "Secret Garden". 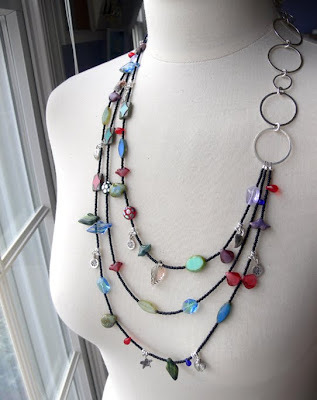 For this necklace, I used a focal that has been languishing in my bead box for quite some time. I normally don't work with yellow. Yellow looks awful on me. The yellow in this focal also wasn't bright yellow or pastel yellow, either -- it's a yellow that's hard to define, and I was just flat out at a loss. 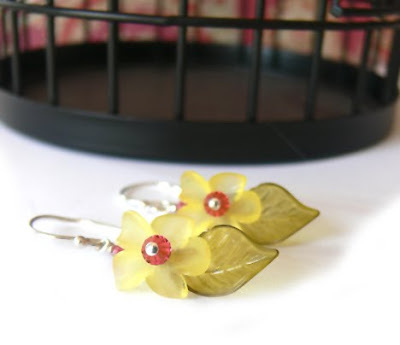 Enter the yellow posies and olive green leaves from A Beadin' Path. They couldn't be more perfect if they tried! Paired with Swarovski's newest color, Indian Pink, I felt like I'd finally found everything to give this polymer clay focal its just reward. I dabbed a tiny bit of glue to the leaves to keep them just so, wired them snugly with sterling to keep them from twisting out of position, and connected it all to a necklace chain that had been accidentally chopped in two. The beaded length and the chain length now fit perfectly together. Of course, I had to make earrings to match. Next I switched to earrings. 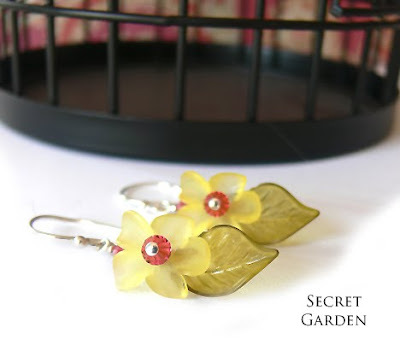 I love using lucite in earrings because it's so lightweight, and with various finishes, sizes, and colors, there's a lot of options out there! 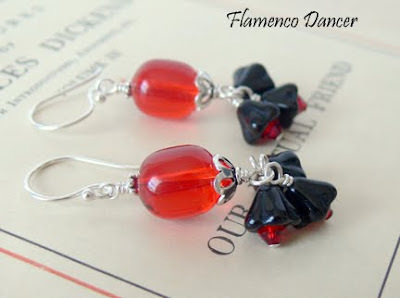 These earrings were made with bright red translucent lucite beads cradled in sterling silver. I went for a flamenco dress look and feel by adding a trio of black Czech glass flowers accented with Swarovski crystal as a "skirt" to the lucite bead. Now I want to show you how one bead can look two very different ways. 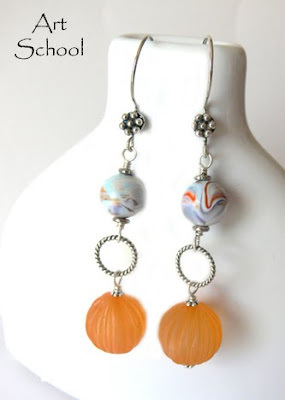 For this first pair of earrings, I used bead LUC4934OR a vintage matte clementine orange bead. I wanted to create a vintage look, and capped the bead with copper filigree, dangled it from a brass oval, and hung them from brass ear wires. "Catalina" is elegant and old-world. Now I took the same clementine orange bead and dug into my vintage lucite stash and found these ultra-cool beads that resemble handmade marbled Italian paper. I linked them together with a twisted wire ring between, and the look is entirely different -- modern and unique. I had an absolute blast working with all the beads that The Beadin' Path sent to me and I'm looking forward to the next installment! Thank you! Now the moment you've been waiting for! I had some beads left over and wanted to share the extras. 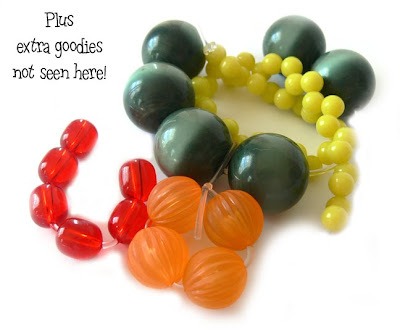 A lucky winner will receive the beads below PLUS some goodies not seen here -- nothing quite as much fun as a surprise! SIX, count them SIX ways to win! And trust me, those who have been in on my bead shares KNOW that I send out great goodie boxes, so you don't want to miss out on this! Contest ends midnight EST Saturday December 12th. Disclosure: The beads listed were kindly provided free-of-charge by beadinpath.com. 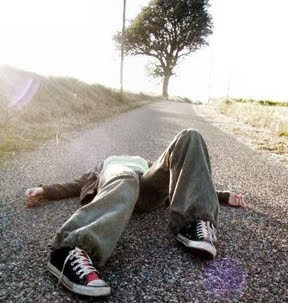 The author of this blog has not received any payment from above-mentioned company. The post above represents only personal opinion of the blog author. Tonight I'll have more designs to show you with the beads from A Beadin' Path, as well as a lucite bead giveaway opportunity! So keep checking back -- it'll be tonight! I love old things. A day poking through an antique mall is a day well spent. I also have a decent collection of vintage beads, but it's been difficult to part with them. 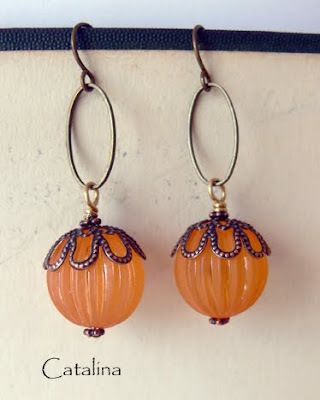 Lately, I've begun adding more vintage lucite bead earrings to my web site -- it's time to share! 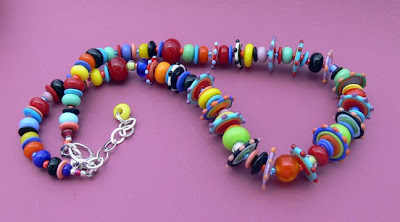 I was recently contacted by my favorite vintage bead store, The Beadin' Path -- would I like to become a Design Partner and receive some beads to create with, then share the designs on my blog? Well I should say SO! The Beadin' Path not only has an awesome collection of ever-changing vintage beads, but cool contemporary beads, gemstones, and pearls as well. The beads arrived, and I sat at my work bench, moving beads around, thinking about color and pattern, looking through the other beads in my stash for accents. Here are two of the designs I've made so far. 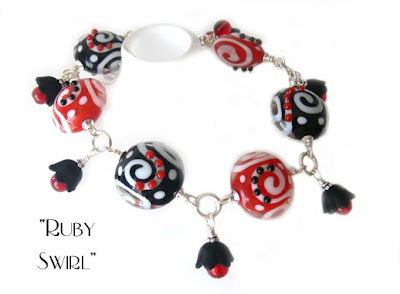 This bracelet was made by clustering charms together, a design I like to use with my lampwork beads. 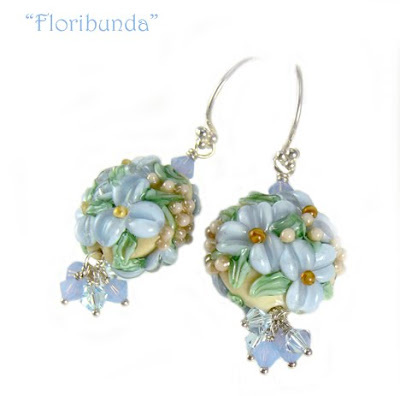 The flowers are made by stacking two different lucite flowers together with a tiny pewter bead cap in front and back. The cream lucite beads are capped in delicate sterling silver, and red coral Swarovski crystal matched the red lucite perfectly. And how about that toggle? I made this necklace with a mix of lucite leaves, teardrops, and rounds. I used Tierracast pewter beads and heliotrope Swarovski crystals from my own stash and linked everything to patterned sterling silver chain. The trick with this necklace is first to connect the charms to every other link, and second to make sure that all the charms are hanging in the same direction so you get a clean line and the necklace lies correctly. 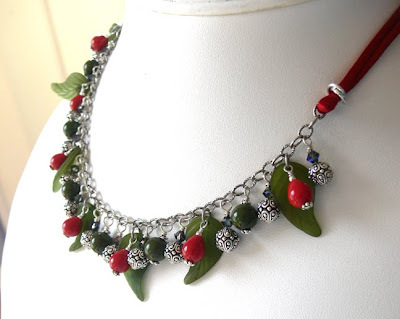 The red lucite beads are wired to the front of the lucite leaves, and the leaves are linked to the chain with jump rings. I thought the necklace had a Christmas look, but not TOO much so -- the shades of green keep the necklace from screaming "I'm Mrs. 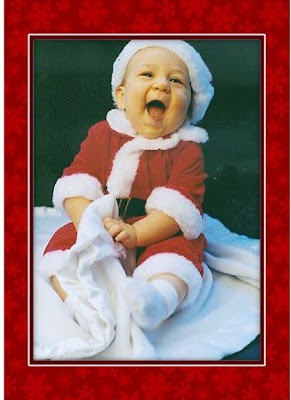 Claus!". 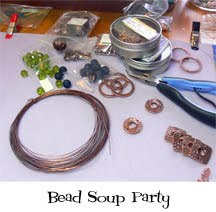 If you can't find the exact beads to make these pieces, explore The Beadin' Path's web site. They have tons of beads, and get new ones all the time. Vintage beads go fast, so check in often for the new additions! Be sure to check back here for Part Two -- not only will I have more jewelry made with lucite beads, but I'll have a lucite bead give-away, and you don't want to miss that! Lori Anderson is a full-time jewelry designer and current insomniac. The Beadin' Path is an awesome bead store in Freeport, ME. I ran my email newsletter this evening and am posting the info here, too. My last sale of the season is free shipping until the end of the year. No matter what you buy, no matter how many times you visit, from now until December 31st (when you should be out celebrating the ringing in of 2010), you pay nada zilch zero in standard shipping. Here are just a few things to tempt you.... now head over to www.lorianderson.net and see what else I've made! I received this Kreativ Blogger award from fellow blogger Simone of "The Romantic Query Letter and the Happy-Ever-After." 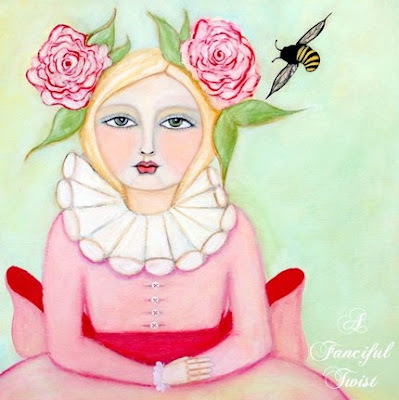 Simone is a historical romance writer and I'm honored that she reads my blog! I'm supposed to tell you seven things about myself and choose seven blogs upon which to bestow this award, but as always with these sorts of things, I can't choose -- I read far too many excellent blogs. If you could see my Google Reader, you'd be amazed at how many blogs I like to read and comment on! I'm recovering from more headache shots (not shots of the fun kind, like a Kahlua Mudslide or a Jell-O Shot, but the cripes-that-stings kind) so my list of seven things will be short and sweet and without pictures. Sorry guys, but I'll make it up to you later! 1) I learned to type when I was eight years old and now type about 90 words a minute. 2) I prefer winter to summer but you'll never catch me on a ski slope. 4) I plan to try my hand at writing a book next year. 5) I've typed and erased a lot of things while writing this list! 6) I'm scared of the dark and still believe there are monsters under the bed. Well, the monster thing I pretty much have a grip on, but the dark thing? Nope. Night lights all over the house. 7) At the age of 11, I took a taxi from a missionary base in the Amazon jungle over the Andes to reach Bogota. Very very very very very steep cliffs. And if there was a mud slide that covered the road, they'd just dig a tunnel, build a small shrine to light candles for the souls of those killed, and carry on. I hope that was interesting enough -- I had a hard time with this one for some reason!